This article provides a solution to a conspicuous lack of tutorials for creating ready-to-use monitoring solutions for Docker containers. Some of us who have been working in performance testing for a long time might still remember the days when the only way to analyze your performance tests was to wait until test execution was over, test reports were created and distribution graphs were drawn. Fortunately, these days are far away from us. Now, we can run performance tests and get feedback instantly, and even choose among many available options how to monitor and analyze our performance testing scripts. Some of us prefer to use monitor performance scripts by using inbuilt performance tools capabilities that we can find in Apache JMeter™, Locust, Gatling, and a list of other tools. Others prefer to work with powerful testing platforms like BlazeMeter, where you can monitor and analyze your performance scripts without literally any additional effort spent on advanced monitoring configuration. Also, there might be some of us who already have some in-house tools inside their company designed to monitor the load scripts in progress. The rest either like or have to build everything from scratch, depending on their current infrastructure, budget, and needs. This article will be especially helpful for the last of the mentioned groups, as we will show how to build a comprehensive performance monitoring solution from scratch, by using open source tools Docker, InfluxDB and Grafana, which can be used later for the monitoring of any test scripts written in any performance test tool. There are many articles on the web that cover monitoring-related topics. Unfortunately, when I was doing the research myself, I couldn't find any ready-to-use guide that would help me establish a lightweight monitoring solution from scratch in a short time. Some of the articles didn't have many important details and I couldn't use them without having to ask "How? Where? Really???" after reading. Others had a very detailed explanation, but were not so ideal from the functional side. That's why I established two goals for my article. First, to make a "ready to go" solution so you will need to spend no more than 10 minutes to setup the monitoring for your scripts. This will be done with Docker, Grafana and InfluxDB. Second, it should be very clear to you how it is done so you can customize this solution later for your needs. So let's get started. A combination of these tools can provide you with outstanding monitoring and analysis abilities of your performance scripts. There are many options to install both of these tools separately or together, but the most efficient is by using the Docker technology. As soon as you have built the Docker file that contains all the tools integrated together in the right way, it takes just a few minutes to spin up these tools anywhere and by anybody. In fact, we have good news for you. We have already cooked up such a Docker file you so you can spin up the whole infrastructure for monitoring in just a few minutes. 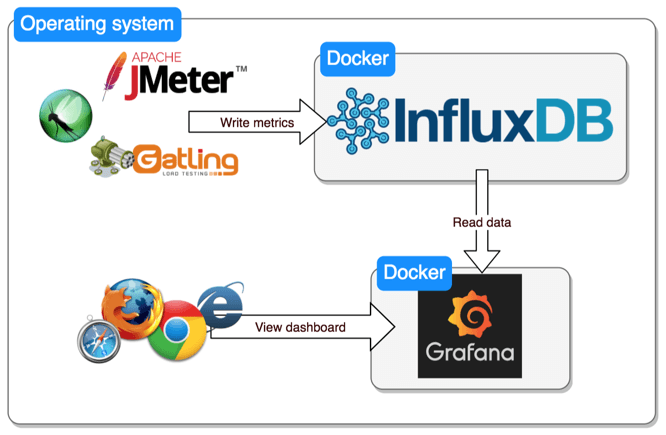 Docker - to spin up the containers with InfluxDB and Grafana. Installation steps here. 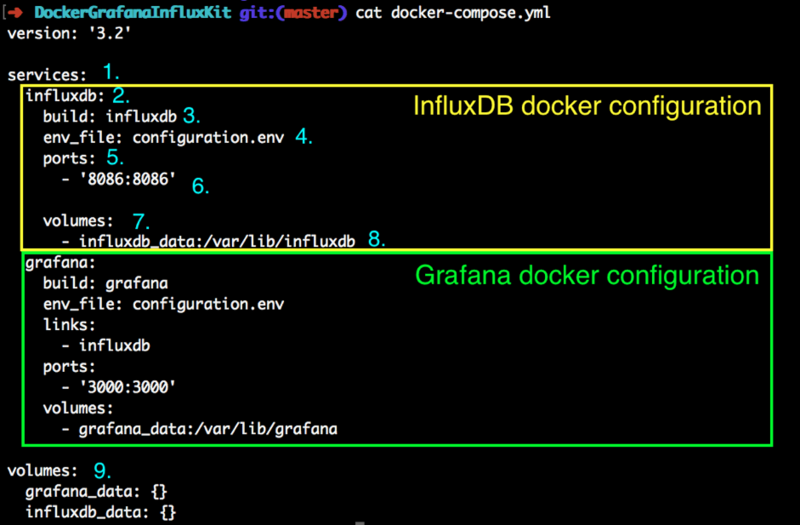 Docker Compose - to integrate the InfluxDB and Grafana containers together and have just one script to rule them all. Installation steps here. To be 100% sure that the integration works correctly, you can click on the 'InfluxDB' data source, scroll down to the end of the page and click on 'Save and Test'. If you got 'Data source is working' then relax, your lightweight monitoring environment is ready and verified! Many articles would end at this point but we have one more goal to achieve. We need to clarify all the details of this solution because it is important for you to be able to to customize it for further needs. If you are an advanced Docker user, you can skip the rest of the article and try out your new monitoring tools. In any other case, let's continue. We are not going to cover the full theory about Docker and Docker Compose as you can find lots of more relevant sources to get a better knowledge of these tools. But we will go over some of the basics and show you how you can take all the required actions with our Docker containers: running the containers together and installing plugins. Later, I will show you how to write queries with the InfluxDB functionality. Briefly, for those of you who don't know, Docker is a simple way to deploy and run software applications. Docker provides you with lightweight isolated containers that behave like a virtual machine, but at the same time share the OS where they have been run. In comparison with virtual machines, Docker allows you to spin up lots of isolated dockers without any additional resources cost. In our solution, which you just ran, we used two different containers. The first container runs Grafana for showing dashboards, while the second one runs InfluxDB for storing metrics. I would recommend going over this article which is very handy for those of you who are not familiar with Docker yet. But why do we need Docker Compose in this case? Docker Compose is designed to combine multiple dockers in one standalone composition, which you can run through one command. This is very convenient when you need to run different containers together in integration. In our case, we need to run two different applications (Grafana and InfluxDB) and that's why it makes sense. You can read about Docker Compose in this article. 1. The services section shows the list of Docker applications that will be run under one docker infrastructure (in our case we have InfluxDB and Grafana dockers). 1. 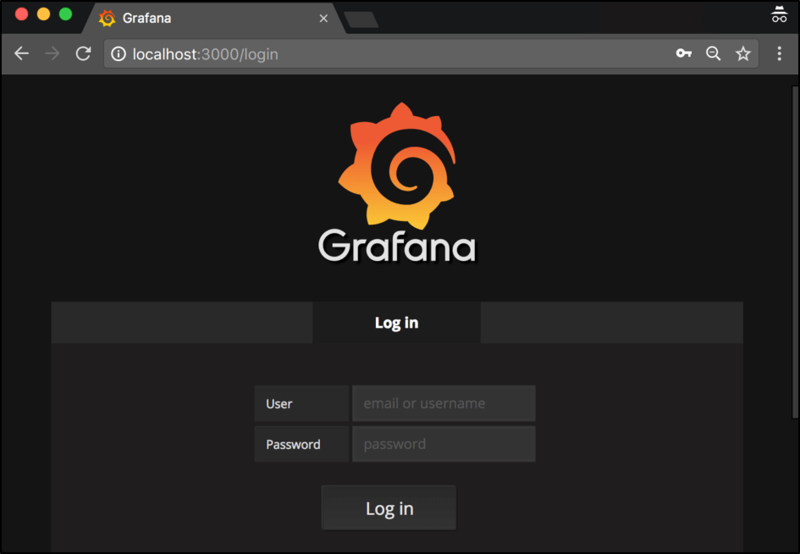 Choose the plugin you want to install from the official Grafana plugins page. 2. 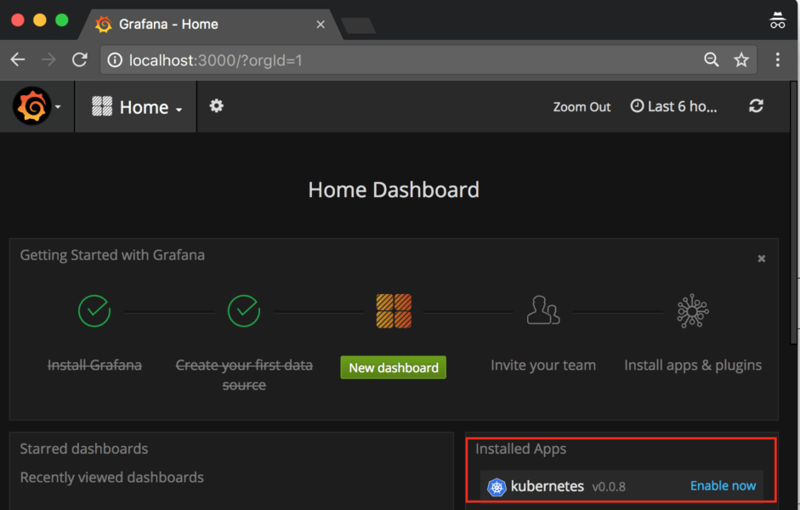 Find the line that specifies the plugin installation command (for example, for the kubernetes plugin the installation command will be "grafana-cli plugins install raintank-kubernetes-app"). 3. From the installation command we should copy the plugin name (the last word in the installation string. "raintank-kubernetes-app" in our case). 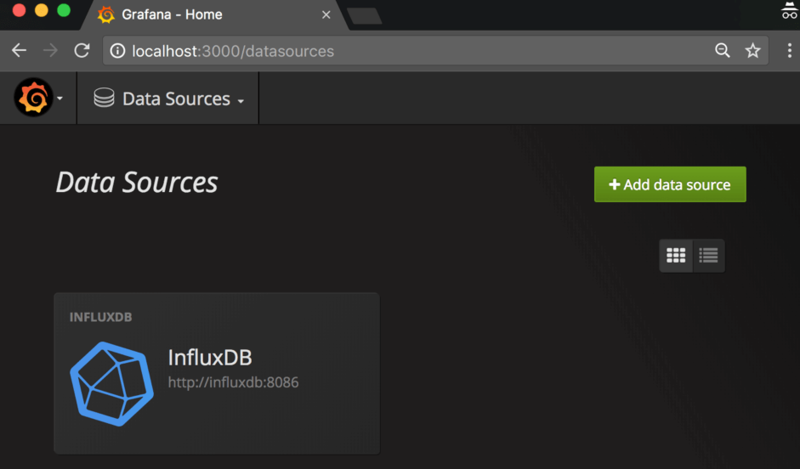 You can check out this page that has a full explanation of powerful InfluxDB syntax, which you can use to write or request data directly to or from InfluxDB. 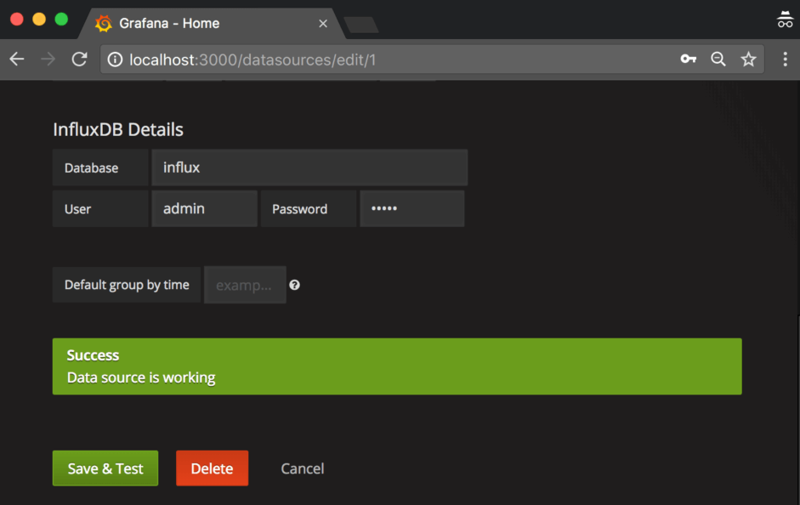 In this article, we have tried to give you a very lightweight integration of Grafana and InfluxDB, by using the Docker technology that can be used for monitoring and storing the test metrics of your performance scripts. In addition to that, we went over the main concepts and steps that might be useful for you as soon as you want to customize the current project for your further needs. Let us know in the comments section below if some of the steps seem unclear or you have some additional requirements that do not fit into the current solution. Simple Scalability - It's easy to create large-scale JMeter tests. You can run far larger loads far more easily with BlazeMeter than you could with an in-house lab. Rapid-Start Deployment - BlazeMeter's recorder helps you get started with JMeter right away, and BlazeMeter also provides complete tutorials and tips. Web-Based Interactive Reports - You can easily share results across distributed teams and overcome the limitations of JMeter's standalone UI. Built-In Intelligence - The BlazeMeter Cloud provides on-demand geographic distribution of load generation, including built-in CDN-aware testing. To try us out, put your URL in the box below and your test will start in minutes. Or request a demo.